Typical home electrical cable has a bare ground wire and two insulated wires inside. Home electrical wiring can seem mysterious, but have no fear: This helpful guide will help you understand how wiring works and how to work with wire. “Electrical wire” is a catchall term that refers to conductors that route electricity from a power source to lights, appliances, and other electrical devices. Wires and cables of various sizes bring electricity to a house and route it to all the lights, switches, receptacles, and electrical appliances. Generally speaking, large cables deliver electricity to the house and smaller cables and wires distribute it throughout. Nonmetallic cable is routed between wall studs; switches and receptacles fasten to electrical boxes. 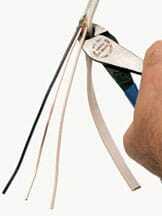 Nearly all household wire is copper, though aluminum is occasionally used. A rubber, plastic, or paper-like coating, called insulation, serves as a barrier to keep the electrical charge (and heat) where it belongs—in the wire (this insulation is stripped from the ends of the wires where connections are made). 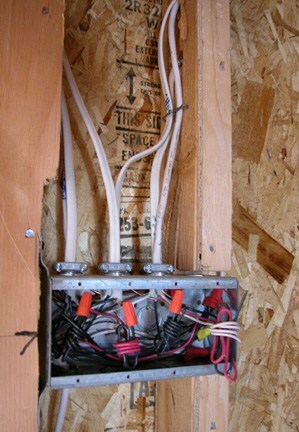 Bare (non-insulated) conductors are used for grounding. Wire is a comprehensive term commonly used to refer to all types of cable and wire. Technically, an individual wire is called a single conductor; several single conductors twisted together or combined together in a sheath make a cable. Just as highways can handle more cars than small streets, large conductors can handle more electricity than small ones. The diameter of a metal conductor is indicated by an AWG (American Wire Gauge) number; the smaller the number, the larger the wire. Most household lighting and receptacle circuits are wired with AWG 14 or AWG 12 conductors. In addition to standard electrical wire, a house has several other types of wire needed for the telephone, cable television, stereo speakers, and so on. Most of these wires do not carry a dangerous electrical current because they operate on very low voltage or carry only sound or picture signals, not electrical power. In this section of HomeTips, you will learn more about the Types of Electrical Wiring and the Types of Wires & Cables. Electrical circuits can incur any number of problems, and, because of the potential fire hazard faulty wiring can present, it is important to diagnose and repair a problem immediately. In Electrical Wiring Repairs, we take you through a list of the most common problems and refer you to other articles that will help you narrow down the possibilities. One of the most common problems occurs with electrical cords and plugs, which can deteriorate after years of use. We show you how to replace them. 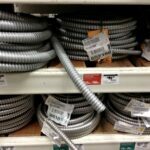 This section of Electrical Wiring is devoted to the many home wiring projects you can do yourself. First we walk you through some basic techniques, such as How to Cut & Strip Wires and How to Cut & Rip Electrical Cable. Then we walk you through such common projects as How to Extend an Electrical Circuit and How to Mount a New Electrical Box. As with all do-it-yourself tasks involving electricity, make sure the power to the circuit from the main panel is turned off before attempting any repairs or installations.